Disclaimer first; all measurements are of the set of shocks delivered to me, on my car and comments relate to what I have found. What happens on your three wheeler might be very different! Out of the box the rear shocks had the preload wound completely off to the end stop on one and about 1mm less on the other, both were at 30 clicks from maximum damping. The front shocks were delivered with about 5mm difference between the preload settings and again both were set to 30 clicks from maximum. The overall free length of the front shocks was 2.2mm different. I fitted the fronts first; the bushes at the bottom end were a very tight fit in the brackets which needed eased slightly to get them in. This is likely due to the brackets being spaced slightly too far apart for the standard shocks leading to them normally being bent inwards rather than parallel when the bolts are tightened, the fit with the new shocks is now really quite good. At the top end the Suplex units have what appears to be a spherical bearing held in by circlips plus a pair of aluminium top hat bushings with O-rings. 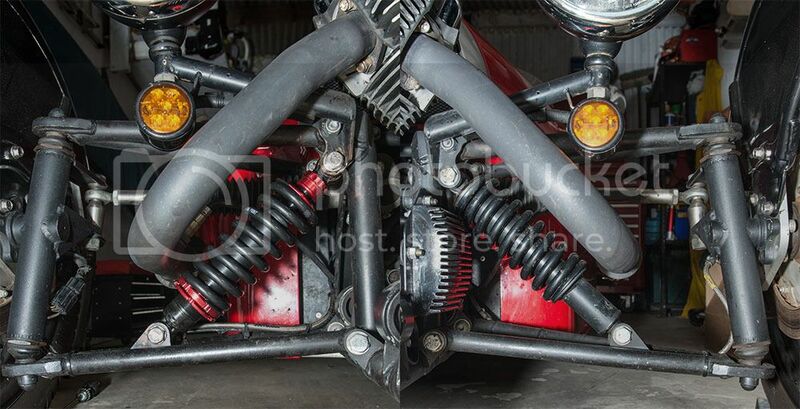 The gap between the top mounting brackets was 4.5mm greater than the top of the shocks, this is a design feature as the brackets are shared with the wishbone top mounts which have longer inner bushing tubes than the shocks. Standard these brackets are fairly severely bent inwards when tightened down on to the wishbones and more so on the shocks even though some of them have a washer or two acting as spacers � this isn�t just on my car! This leads to them being well out of parallel as standard. I fitted two heavy M12 washers on the top mount of each shock as spacers which gave a good fit. 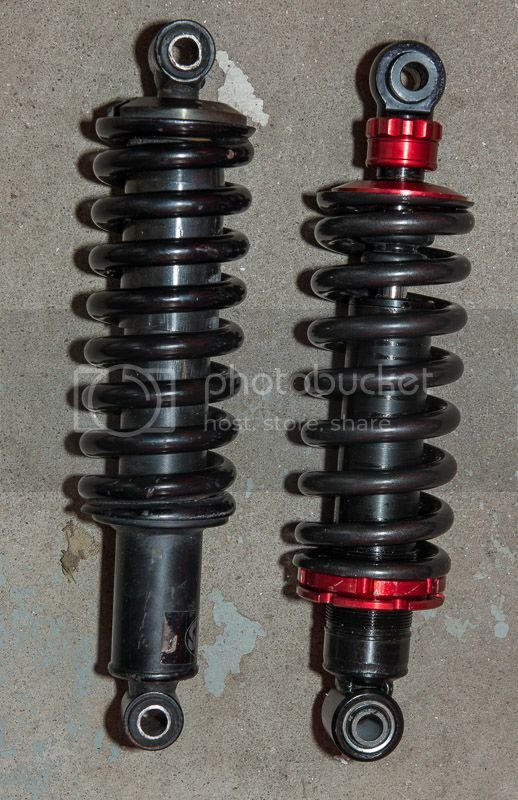 On the right the spacers went forward of the shock and on the left they went behind the shock � this was just how the shocks sat once the bottom bolt was in place. Initially I set the preload on both shocks to 55mm lock ring to eye as suggested in the instructions. This caused both exhausts to foul on the preload adjuster rings when pushing down on the front end � I didn�t drive with it like this. Adjusting them to 57.9mm (LHS) and 58.4mm (RHS) lock ring to eye looked to just give clearance between the adjuster rings and the exhausts on maximum travel and so far this seems to be the case. 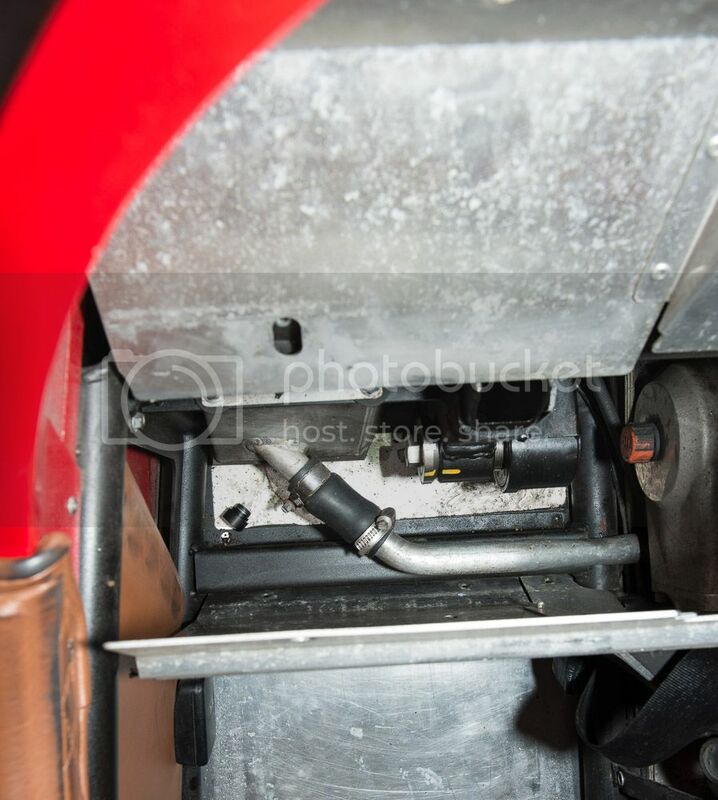 At this point I had a ride height of 136mm measured on the lower chassis tubes just forward of the front lower wishbone mount on both sides � underside of tube to flat concrete floor � with the standard shocks ride height had been 150mm both sides. I went for equal ride height left and right at this stage mainly because I had to set them to something rather than any deeper reason. The rear shocks were a seemingly straightforward fit once I had the car high enough on the axle stands to be able to drop the wheel far enough on a trolley jack to get at the lower bolts. I took a guess at a preload setting and set both shocks to it on the bench before fitting them. Interestingly though the shocks this time were the same length the distances between the mounting brackets were about 1.5mm different side to side. Once fitted I adjusted them to give the same ride height as standard as a starting point and went for a short drive. First (short) drive; the front end seemed pretty decent but the back was terrible � very harsh and pumping down over bumps, pretty much undriveable really so I had another look at the shocks. On both sides the upper (soft) section of spring was completely coil bound and this without me aboard so I backed the preload off till I had the recommended 314.5mm eye to eye on both sides (as ever as a last resort; read the instructions) this needed slightly different preload on each side and left the right spring all but coil bound (about 0.5mm maximum gap between windings) on the soft windings, the left having some genuine space between these windings. Fourth drive; backed off to 45 clicks on rears and another improvement. Front still good. That�s it so far. My overall impressions at the moment are that the front shocks are good; they ride the bumps much better than stock and there is no longer the feeling of constantly battering off of the end stops on bumpy roads taken at fun speeds. I will no doubt try to fine tune the front in due course but wouldn�t be at all surprised if I ended up back where I've started. The rear is more complicated and I think it will need a good deal of experimentation to get it to work. I�m going to need to try less preload and then play with the damping then try more preload and again play with the damping. I have a nagging suspicion that what is required to make the back end work is a set of springs slightly lower rate than the high rate section of the supplied springs but single rate, no rising rate; I�m not sure what good a coil bound spring is even with �internal rebound assist� springs whatever they are. I may also re-fit the standard shocks to see what happens which will also give me a chance to measure the Suplex springs best as I can; might even take the springs off to see just how similar they are to each other. It is certainly possible that part of the issue with the rear is that the front is substantially improved which is highlighting any deficiencies at the rear and that refitting the Spax units might confirm this. Incidentally since the back end of the M3W is basically a bike configuration I measured the static sag which came out at 15mm at my last pre-load settings which seems like a lot but then it is a road car not a race bike which I would normally have started at somewhere between 0 and 5mm of sag. Clearance between the Suplex (left) and Spax (right) shocks and the exhausts. Side by side of Spax and Suplex front shocks. Top mount gap on front shocks with and without spacers. Where the dislodged top hat bush ended up! Edit Reason: File manager fought back and needed tidying up. Would certainly be very happy to have your settings when you have finished your trials and adjustments. My concerns that you'd have the same issues of adjuster ring hitting the exhaust with the comfort kit fitted, as I had with the Empire Kit seem to have been confirmed. I have the Spax (not Suplex - oops) kit back on and am waiting for a replacement set given the first set didn't work. Would certainly be very happy to have your settings when you have finished your trials and adjustments. My concerns that you'd have the same issues of adjuster ring hitting the exhaust with the comfort kit fitted, as I had with the Empire Kit seem to have been confirmed. I have the Suplex kit back on and am waiting for a replacement set given the first set didn't work. My guess is that the original Suplex shocks as fitted to the first handful of cars were quite different externally - I don't have access to one to compare - and that anyone trying to get the ride height low enough to eliminate the bump steer without the comfort kit is going to be disappointed or will have issues with broken exhausts! Conversely at some point lowering the ride height with the comfort kit is going to put some strange angles on the track rods which should bring back the bump steer. Talking of ride height I describe the Suplex shocks as having preload adjustment on the springs rather than ride height adjustment deliberately. Ideally the shocks would have separate adjustments for each so that the preload can be altered for different load conditions without necessarily affecting the ride height. Calum - typo in my post, I have the Spax back on awaiting Suplex replacements. An interesting post , thanks Calum . As mine are being fitted at the factory it'll be interesting what settings they use . Bearing in mind the price of them it's disappointing that the C spanner is not up to the job . It's also a bit confusing about the difficulties you are having sorting out the rear . One of the main reasons I decided to go for them was PJB's posts explaining how they'd been specially developed and tuned for the M3W . "typo in my post, I have the Spax back on awaiting Suplex"
I wouldn't worry about it - I managed to read it as Spax first time round anyway! The issue with the C-spanners is lack of clearance to move them once they are hooked on and I'm sure it's not unique to either Suplex or three wheelers and certainly did not come as a surprise. I'm just about to go wash the weekend's layer of crud off the car and then try altering something on the rear to see where it takes me. 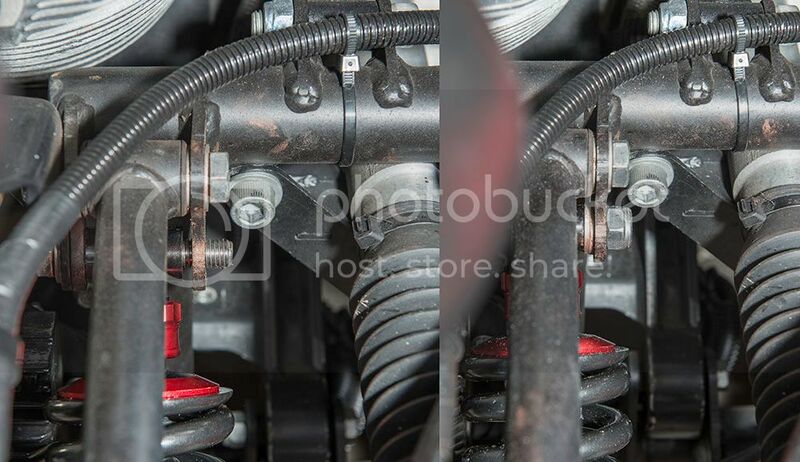 I know this is all about the shocks but in the picture of the front end that shows the stock spax unit, it appears that you have turned the voltage regulator 90 degrees from the stock location. I had thought of doing that since it would reduce the amount of shear vibration. Are your bobbins lasting longer? Also, I am not familiar with the term "chocolate teapot territory" other then to assume that adjustments are difficult at best? A chocolate teapot is very similar to a chocolate fireguard! [Edit] Ah - you got there before me, Calum and Chas. Very interesting info, Calum. I presume it is merely very difficult, rather than actually impossible, to adjust the rear dampers in situ... What do you mean by "the old-fashioned way"? Is a hammer involved in that?